MaassMedia announces the launch of its comprehensive analytics training program for organizations. 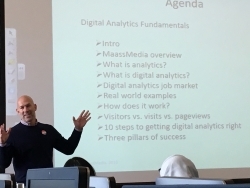 MaassIQ Digital Analytics Training is a customizable program, offering course tracks in Google Analytics, Adobe Analytics, Data Visualization, and Strategy. Philadelphia, PA, February 01, 2018 --(PR.com)-- MaassMedia, the digital analytics consulting firm based in Philadelphia, PA, announces the launch of its corporate digital analytics training program, MaassIQ. MaassIQ offers all-inclusive courses that focus specifically on professional development and digital transformation within the organization. MaassMedia’s analytics consultants teach the courses, and personalize the programs based on a company’s vertical, use cases, and data. Course offerings include Google Analytics, Adobe Analytics, Data Visualization, and Digital Analytics Strategy. Once the coursework is complete, MaassIQ instructors also facilitate the foundation of an analytics “community of practice,” in which employees from the program can share knowledge with each other, and establish practices for analytics-based decision making within the company. “By offering analytics training for organizations and their employees, we can focus on each company’s own datasets, use cases, and analytics questions. Even with experienced new hires, it can take a while for managers to mold their skills to the unique business problems of their new organization,” says Aaron Maass, CEO of MaassMedia. "MaassIQ gives analysts, marketers, executives, and sales and UX teams a thorough grounding in how to use web analytics tools like Adobe Analytics, Google Analytics, Domo, and Tableau, how to create reports and metrics, and how to analyze numbers. We work to help participants come to a common understanding of their organization’s analytics challenges and goals. The potential benefits are many, including increased employee retention and job satisfaction. After the courses, employees are better equipped to work on your biggest analytics challenges." MaassMedia has worked with leading corporations and businesses across the country including URBN, Philly.com, Brother International, Eastman Chemical, and ESPN to launch custom training programs. For more information on MaassIQ visit: http://www.maassmedia.com/analytics-training/. MaassMedia is a specialty analytics consultancy based in Philadelphia, PA that provides guidance and leadership to leading global brands seeking to optimize their investments in digital multichannel content, marketing, and customer experience initiatives.